The face-up in the images could be slightly different from the actual product. -We do not take claims about these reasons. If it’s possible, had better to avoid that exposure too much time to the sunlight. The props in the pictures are not included which are not mentioned. For the characteristics of making process, dust, air bubbles or scratches may appears. 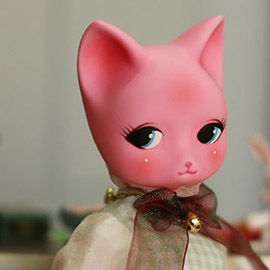 Due to the different making process, PVC material dolls have different quaility from resin(BJD) dolls. Also it's softer than resin dolls.